Depending on which headline you believe, supplements are either a waste of money or, according to the most provocative of declarations, can actually kill you. Fortunately, consumers are becoming increasingly more savvy in discerning between news that’s trying to attract vs. that whose intention is to inform. Many are learning what to look for and the questions to ask when comparing brands. It’s no secret that the supplement industry is not regulated. Unlike pharmaceuticals which must prove absorption and efficacy, I believe most people are wasting money on vitamins and herbal formulas that are not properly formulated for bio-availability. Or, they lack the active ingredient. Or, the content varies widely from what it listed on the label. Or, the claims of results have not been proven in valid studies. Or, all of the above! I’ve always said that the most expensive vitamin is the one that doesn’t work. I was once one of those people. Before I switched, I thought I was using a top of the line brand. I’d researched a lot of companies and was using what was suggested by my natural health practitioners. I was loyal to the products I was using not because I was noticing results (which I wasn’t), but because I thought I was taking the best. When I did switch brands (only because of the 100% money back guarantee) and noticed more energy, better sleep & no afternoon slump in my first month, I realized the Shaklee brand really WAS different. Anecdotal evidence like mine is certainly nice to have. However, anecdotal evidence is the only thing most nutritional companies have to support the efficacy of their products. Sure, they might be able to tell you about all the amazing raw materials, their great manufacturing procedures and validation of quality assurance, but they can’t point to much (if any) “end of the line” proof that their products do what they say they do. Offering up benefits such as “GMP Certified” while seemingly impressive, is, in the end, a shiny object deflecting attention from the fact they don’t have anything else to show you under the hood. The Landmark Study is the largest, long-term supplement study ever conducted. It is a THIRD PARTY, unbiased published study conducted by the University of California Berkeley School of Public Health which proved that people who used Shaklee supplements had markedly better health than those using another multivitamin brand and those who used no supplements. The key element to remember is that when a study of this nature is conducted, the results will be published no matter the outcome. This means the company (in this case Shaklee) risks an outcome that could be unfavorable and it would be published for all the world to see. Therein lies the #1 reason companies will NOT do this type of rigorous validation for their products. 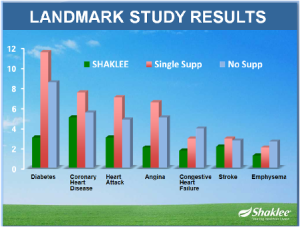 A formulation might look good in theory, but time and again during product development, Shaklee has had to return to the drawing board when the final product failed to perform as expected. Think of it this way: Let’s say you’re on a mission to make the most delicious chocolate chip cookies known to mankind. You have the purest, highest quality ingredients. You’ve researched hundreds of recipes to develop your most delicious formulation. You mix, cook and bake them in the cleanest environment, using really cool, state-of-the-art mixers, cookie sheets and ovens. You do all this and package them all up to sell to your customers without ever tasting the finished product. How crazy is that?!! You can’t possibly know how delicious your end product is if you don’t taste it, right? This is exactly what many (most) nutritional companies do. They produce products (cookies) they never test (taste). Why? Two reasons. They are not required to prove their products work and it is extremely costly (not to mention risky) to submit a product to the scrutiny of well designed, third party validation. This is what makes the 100’s of clinical studies Shaklee has to support their products, along with the Landmark Study, so remarkably important. This clinical study compared 3 groups of people. 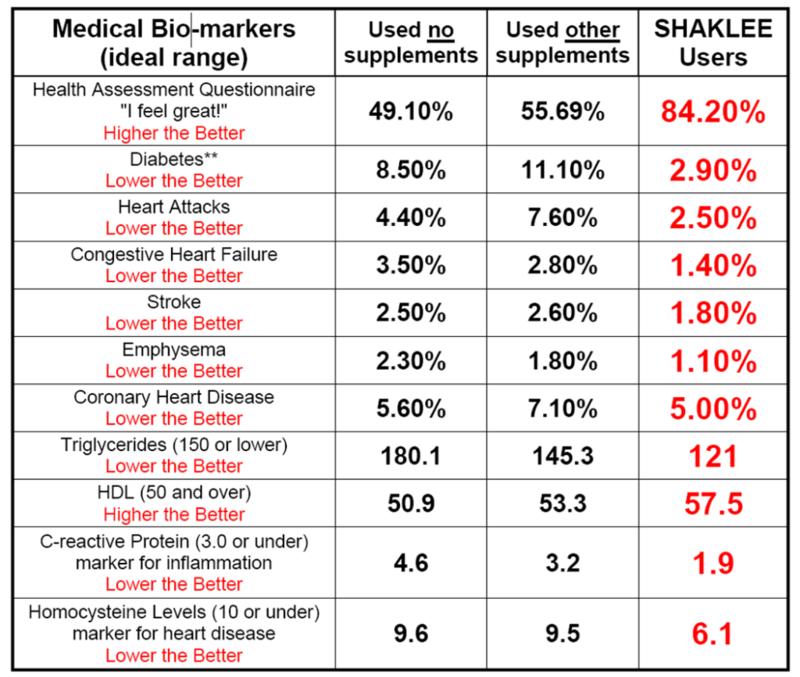 Shaklee group used supplements for at least 20 years . It is interesting to note in the chart below that in some cases, those using another brand actually had worse bio-markers than those using nothing at all. This is yet another reason why brand & quality matters. The study, in its entirety, can be accessed HERE. **If an independent Shaklee representative invited you to this page, contact them. If you need help and do not know a rep, click here to view any supplements mentioned above or contact us.